Issues of underrepresentation in the sciences (based on race/ethnicity, gender, socioeconomic status, first-generation college status, or having attended under-resourced high schools) are tied to longstanding social and cultural inequities that are difficult to address using singular program elements. 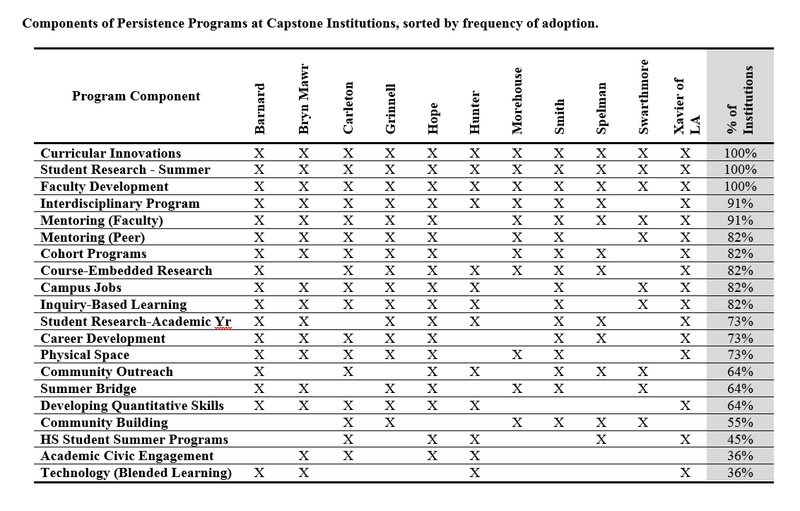 The Capstone institutions strive to achieve inclusion through an interlocking network of support (see table in sidebar), from increasing access to our institutions to supporting students once they arrive. 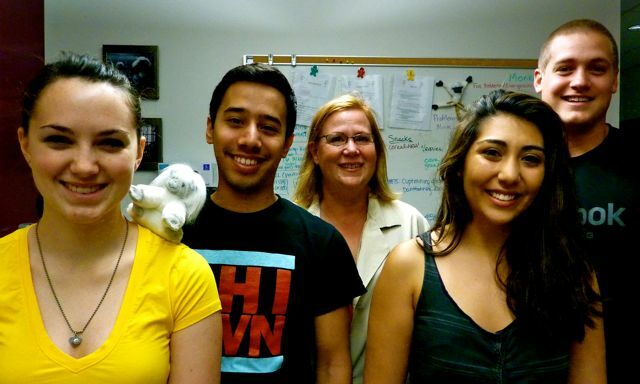 While the intent of such initiatives may be to improve persistence of specific groups of students, the experience of the Capstone Institutions suggests that such changes in fact benefit all students and the development of this robust set of programs has required our institutions to change, rather than expecting our students themselves need to change. Persistence in STEM disciplines begins with broadening the pool of potential future scientists, including outreach and pre-college preparation activities that engage K–12 students and science teachers in scientific activities and curriculum that foster a curiosity in STEM disciplines and provide opportunities to enhance skills as well as gain research and lab experience. 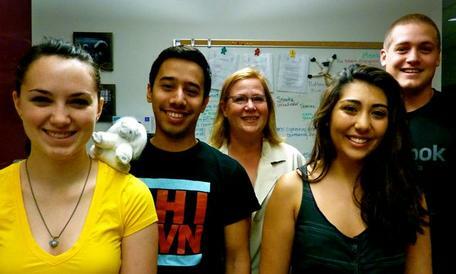 Students' identity and sense of belonging to a community of scientists, through cohort and mentoring programs as well as shared spaces and collaborative STEM projects and coursework, help them to engage and remain in STEM. Persistence in STEM largely depends on academic success in STEM courses, which in turn depends on making sure all students have the tools they need to succeed in the first year and beyond—including adequate quantitative reasoning and writing skills, as well as appropriate study habits and learning strategies. 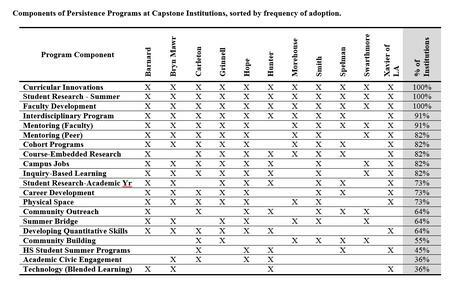 Capstone Institution efforts that support persistence of students in STEM in a sustained and systematic way share a number of common features, including thoughtful assessment as well as creation of a institutional culture that values inclusive excellence. In addition, there are essential values and mindsets about student capacity that must be shared broadly by a community in order for persistence efforts to flourish.